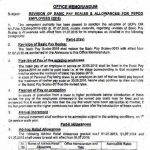 Pay Scales for the Govt Employees were revised on 01-12-2001 vide Finance Division Regulation Wing Notification No. F.1 (5) Imp/2001 dated 4th September 2001. 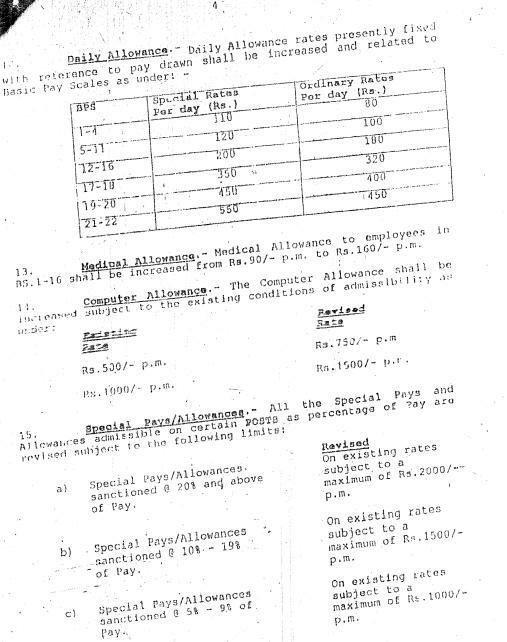 These pay scales were a huge shock for many employees as there were many benefits the employees already availing, were discontinued, although the salaries of the employees increased on large scale. These pay scales were revised after a long period of about half & seven years. 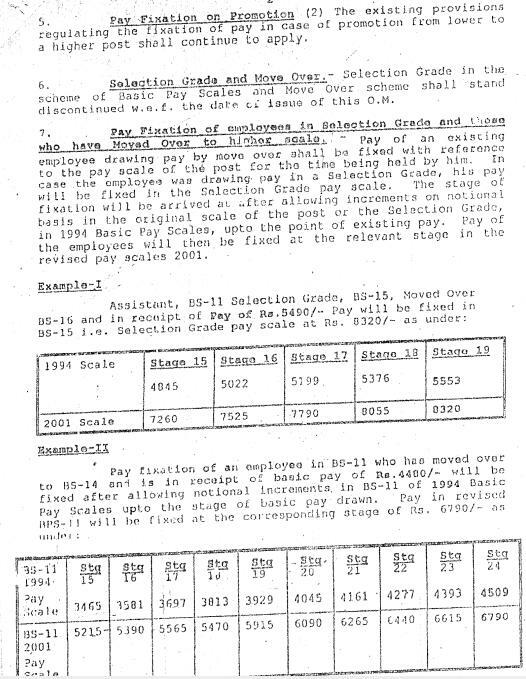 Before Revised Pay Scales 2001, pay scales were revised in 1994. Here are some salient features of the Revised Pay Scales 2001. Cost of living Allowance @ 7% was ceased as well as Adhoc Relief Allowance @ 300/- Pm & 100/- PM. Special Relief Allowance @ 20% & 25% of the initial of the scales 1994 was frozen. The scheme of Selection Grade & Move Over was discontinued. Thus the employees who were in higher scales by virtue of Move Over were pulled back into their original scales. The scheme of Advance Increments on having higher qualification was discontinued. In this way the employees who got higher qualification than the required education for the same post suffered a financial loss after 01-12-2001 and they still waiting for the restoration of the scheme of Advance Increments. 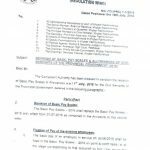 The Medical Allowance to the employees of BPS-01 to 16 was increased from Rs. 90/- PM to 160/- PM. 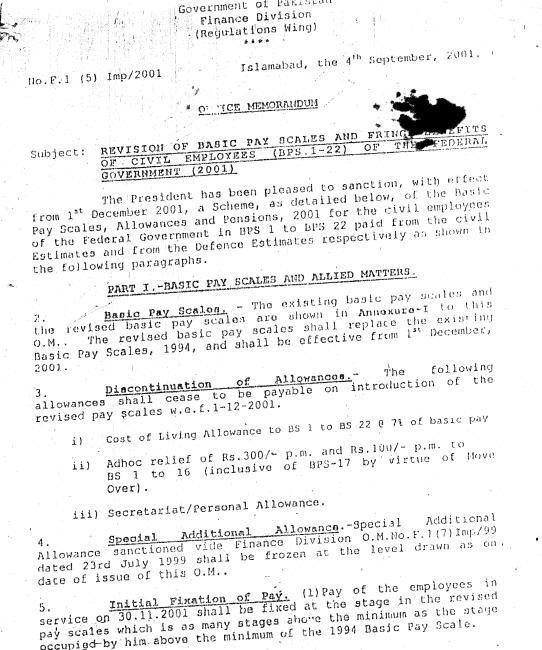 For other details of Pay & Allowances read the notification copy attached. 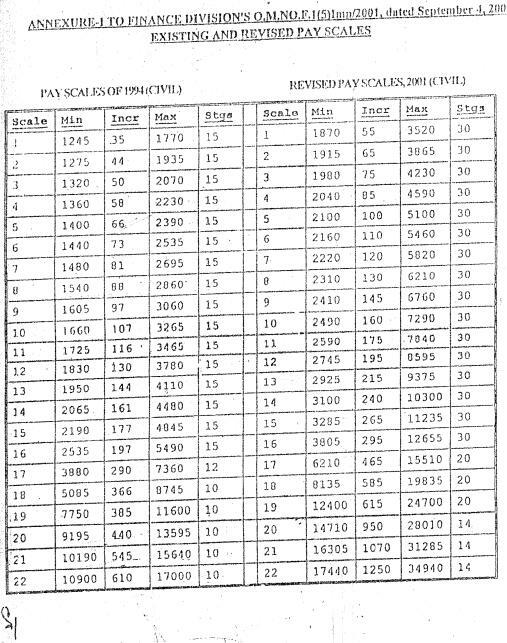 With profound vanirationi it is submitted that i was move over in BPS-12 on 31-12-2000 and my pay was fixed 3780 per-month.The last stage of the scale However i was promoted in the same scale no-12 on 30-05-2001 and my pay was also fixed RS-3780 per month. No Benefits was given to me on promotion in the same scale.Kindly review my case and if necessary increments is allowed as per excisting rule may please be given necessary information and oblige please.Your corporation is requested. 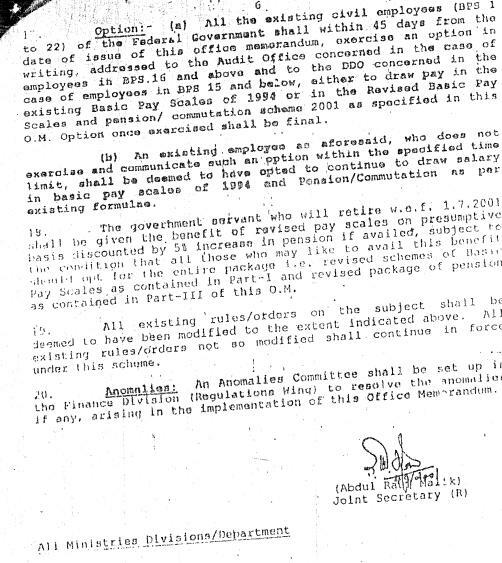 The Govt employees who were reverted to their original scales on 1-12-2001 from the higher scales of "Move-Over" & their pay was fixed on the last stage of the original scale with the result that their annual increment stopped in the later years & they remained deprived of annual increments till 1-7-2005. 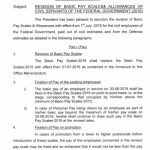 I have just come to know that a remedy in the form of "Personal Pay" was provided later on in a certain revised pay scale scheme. Will you kindly elaborate at your earliest convenience the said "Personal Pay" formula introduced some time afterwards to redress the issue of the stoppage of annual increments? I shall be grateful to your good self for the courtesy and kindness. 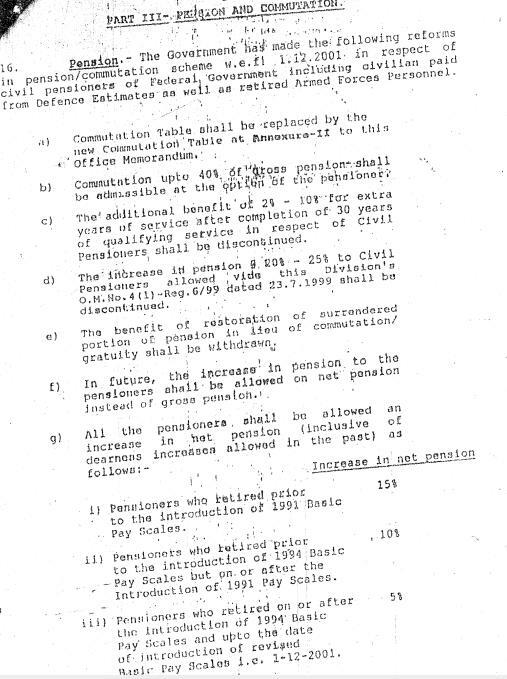 i was retired from wapda on 02-02-2002 attaining the age of 60 year.my pension was calculated in the old pay scales in operation prior to 01-12-2001 wather my computed portion of pension well be restored after 12 years or 15 year. Dear Rab Nawaz Khan, increment on 01-12-2001 was granted. 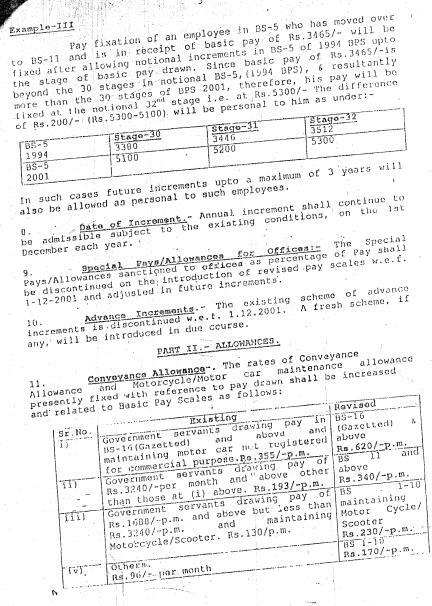 i promoted from sr tech to sr plant maintainer in next higher scale on dated 22-2-2001my pay was fixed as existing rules of that time but on introduction of new scales of 2001 if my promotion would taken after these scales my pay could fixed 1xmore increament than that which was fixed on 22-2-2001. and now my coligue who is junior to me and is in same scale ie sps-7 and his pay is one increament >mine, Madam can i aply for anomly against him. i really appreciate your efforts that you have provided a platform for govt employees, in which all employees can share their problems. Thanks Dear for appreciating mine little efforts for the employees. kindly tell the status of revised qualification pay and TA/DA in Punjab. Dear the notification of the same has been issued. how many chances are there for revision of pay scale? i think the story of pay scales has gone. 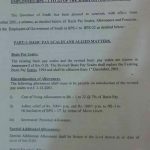 2001 ke unified pay scales ke kuch hi salon men 20 hazar wale 40 per ponch gaye kionke unified Basic pay increase kerte hain aur take home salary basic per depend kerti hai. 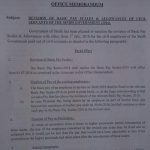 Allah kare 2012 men bhi Unified pay scales hojaye. This article was published by the demand of many visitors as they wanted to know about this notification and they needed it too. What are the chances of restoration of Advance Increments on having higher qualification.